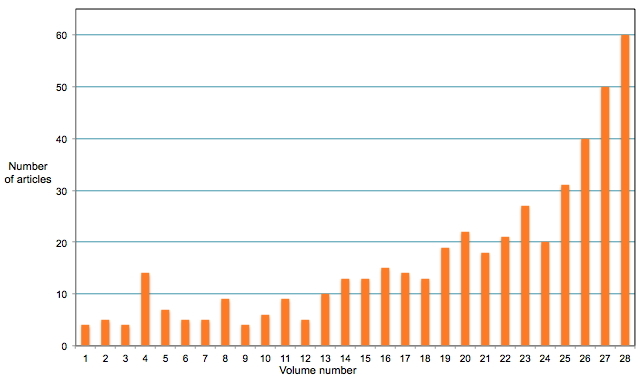 IIER's numbers of articles published per volume (per year) has increased markedly, almost doubling in only 3 years from vol 25 to vol 28 (Figure 1). This is not a sustainable rate of increase, but what is an appropriate rate for a journal in IIER's circumstances? 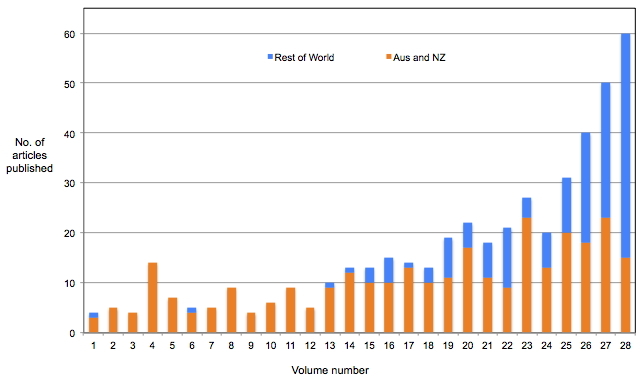 Dominance in country of origin (Figure 2) has continued to move away from Australia and New Zealand towards "Rest of world" (i.e. all countries other than Australia and New Zealand). Given that at present IIER's editorial staff and reviewers are almost wholly Australian, is this trend appropriate, and how may the "Rest of world" become better represented in sustaining the journal? 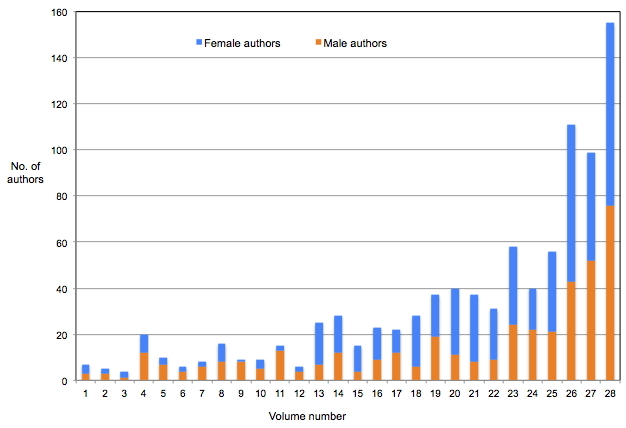 Author gender data can show wide variations from year to year (Figure 3), but is perhaps trending towards lower variations and a small majority of women authors, maybe in the range 52-57% women. Is IIER's author gender data consistent with expectations in academia and broader trends in society generally, concerning gender equity? Of course, the questions identified above are only a small subset of the contemporary questions that arise in scholarly journal publishing. There are several very important further points to note. Firstly, Figures 1-3 are concerned only with published articles, so we need to conduct similar analyses for all articles submitted to IIER. That is a work in progress, as time permits. Secondly, the aggregate "Rest of world" does not show the problem of uneven representation of some regions or countries. For example, some countries in the Middle East region are well-represented in IIER (e.g. Turkey and Iran), whilst some countries in the Asiatic region are under-represented (e.g. Indonesia and India). This is also a "work in progress, as time permits", in which we intend to follow the region classification scheme used by Scimago (Scimago Journal & Country Rank, 2019). The Scimago classification distinguishes eight regions comprising Pacific (Australia, New Zealand, Fiji, Papua New Guinea and others), Africa, Asiatic, Eastern Europe, Latin America, Middle East, Northern America, and Western Europe. Thirdly, there are likely to be interesting inter-country and inter-region differences in the representation of women authors. Some countries and regions have attained or surpassed the longer term estimate of "52-57% women" given in 3. above, whilst others are somewhat behind trend. This issue is yet another "work in progress, as time permits". From the IIER bibliometrics page (http://www.iier.org.au/about/iier-bibliometrics.html), readers may access IIER data provided by Google, Scopus and Scimago. We are pleased with IIER's start to 2019 with higher rankings. Scimago has accorded IIER rank 500 amongst 1262 education journals indexed (IIER's first appearance in Q2; previously Q3 and Q4), and Scopus has given IIER rank 469 (51st percentile) amongst 979 education journals indexed. Readers who are interested in bibliometrics for IIER, at both journal level and article level, may be reassured that IIER's approach endeavours to be based firmly upon the ten principles outlined in Hicks, Wouters, Waltman, de Rijcke and Rafols (2015). IIER Associate Editors Dr Jenni Parker and Dr Rita Tognini retired at the end of 2018 after three years of highly valued services. Jenni and Rita contributed much to IIER's editorial staff procedures, and, very importantly, also to what we may describe as the evolution of IIER's mission. During 2016-2018 we had to adapt to rapid increases in numbers of articles, as illustrated above in "Revisiting some IIER statistics", whilst striving to maintain a high quality of formative feedback to authors. We thank Rita and Jenni very warmly for their contributions of very many hours of excellent service to authors and IIER, and we wish them all the best for their new endeavours in 2019 and beyond. Created 19 Jan 2019. Last correction: 13 Apr 2019.